The elements of the standard imaging protocol used at the Robert-Bosch Hospital are shown in Table 6.3. Continuous monitoring of blood pressure and ECG is performed. Special infusion systems are used if continuous intravenous medication is given. If imaging in a mechanically ventilated patient is necessary, a ventilator with special tubing is in place. As a first step, transverse, coronal, and sagittal 2D localizer images are acquired using an ultrafast breath hold echo-planar CMR technique. Echo planar imaging is followed by transverse steady state free precession (SSFP) gradient echo cine imaging starting at the renal arteries and then moving cranial in 10 mm steps (6 mm slice, 4 mm gap) up to the carotid arteries. In addition, half Fourier black blood still frame spin echo imaging (HASTE) is performed in the exact same imaging planes as the previous cine images in one breathhold (Figure 6.10). 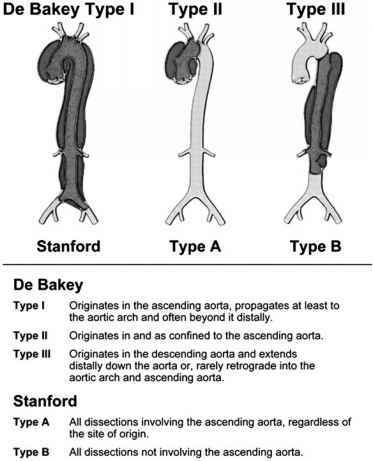 Based on the transverse data, oblique parasagittal SSFP cine as well as HASTE images are acquired allowing the evaluation of the ascending aorta, the aortic arch and the descending aorta ("candy cane projection") (Figure 6.11). If necessary, cine as well as HASTE imaging can be repeated in an additional plane (e.g., to evaluate an intimal flap or entry). A three-chamber view is taken to assess the presence and severity of aortic regurgitation and to assess the function of the left ventricle in the long axis. At the end of an examination a three-dimensional gadolinium-enhanced MR an-giography is performed. The sequence used is a gradient-echo pulse-sequence with severe T1-weighting. The acquisition is performed in a single breathhold without ECG-triggering. Accurate bolus timing is accomplished by using a test bolus. The three-dimensional dataset can be displayed in every possible plane. Slices in the oblique sagittal plane are shown in Figure 6.12. The surface of the vessels can be reconstructed as a maximal intensity projection (MIP) image in a three-dimensional dataset and displayed as a figure, which can be turned in every direction, as shown in Figure 6.13. Large entries can be seen on 3D images. However, identification of small additional entries and reentries may require the use of flow-sensitive pulse sequences. If questions about the extravasation of blood remain an inversion recovery sequence is performed. In addition to this basic protocol, phase contrast flow mapping gradient echo CMR can be performed in any plane to differentiate between intramural hematoma and false lumen as well as to evaluate flow in a true and/or false lumen respectively. The combination of different sequences results in a high sensitivity and specificity and facilitates the assessment of all important features of acute aortic syndromes. Figure 6.10. Transverse T2-weighted HASTE sequence in a patient with type A aortic dissection. Blood is visualized as black (black-blood technique). All images are taken in a single breathhold, gated. The intimal flap is clearly delineated. Figure 6.12. 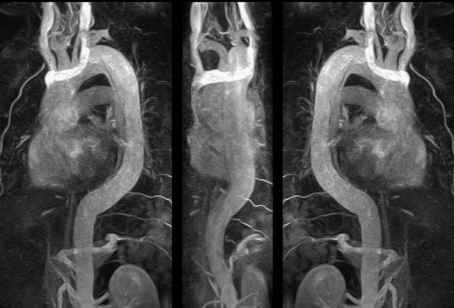 MRI 3D angiography in a patient with type B aortic dissection. Oblique sagittal view, parallel slices, slice thickness 1.2 mm. The entry and reentry sites can be clearly delineated (arrows). Figure 6.13. 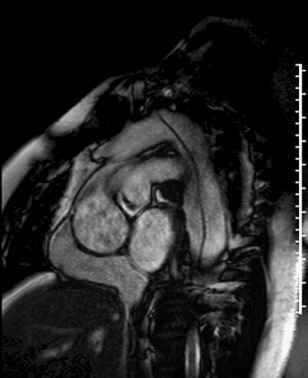 Surface reconstruction of a MRI 3D-angiography in a patient with type B aortic dissection. In our experience, an examination with the basic sequences in not-ventilated patients takes about 25 min, depending on the number of sequences. It takes about 5 minutes to put the patient in the scanner and prepare him for the examination. The basic sequences (scout, transverse HASTE, transverse SSFP, SSFP in the oblique sagittal view, SSFP in the three-chamber view) take about 15 minutes. In patients with an acute syndrome, at this point it has to be decided if to proceed to the operation theater or if further information is needed. If it is decided to perform a full protocol with phase contrast sequences, an-giography and inversion recovery sequences additional may be necessary.